This jewelry piece has been embedded with Navaratnas – nine precious stones or jewels, namely, ruby, diamond, pearl, coral, hessonite, blue-sapphire, cat’s eye, yellow sapphire and emerald. The tradition of Navaratna - ornaments, a Navaratna - pendant, Navaratna-necklace, ‘Navaratna - kundalas’ – ear-ornament, Navaratna - ring etc., goes back to classical age. Not so much the jewelers as the astrologers played the role in conceiving the each stone’s place and priority and relative sizes in an ornament, as also ascertained its quality and impact on the wearer in relation to his or her Zodiac-sign. 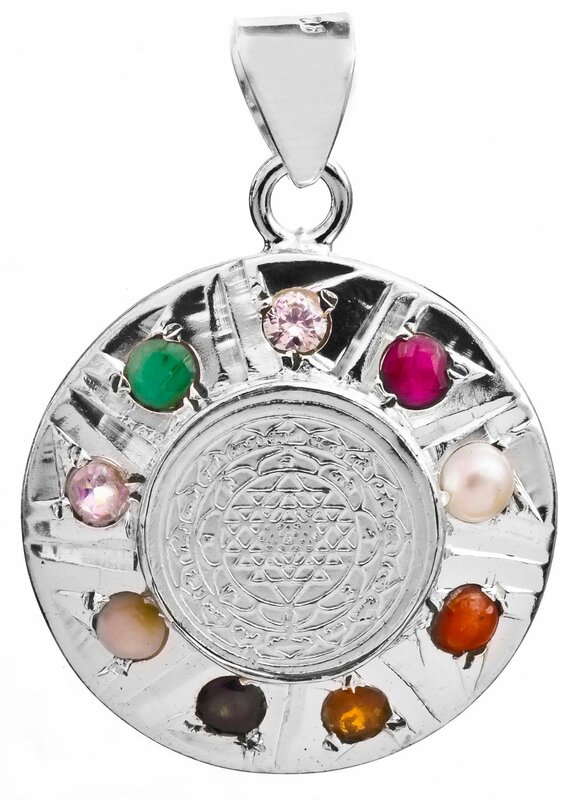 The talismanic role apart, and not only that the nine jewels attract all across the world, even the Sanskrit term ‘Navaratna’ is used in trans-borders languages, Burmese, Indonesian, Nepalese and of course Hindi and other languages of the land. Astrological traditions, not merely in India but also in the globe’s other parts, link these nine jewels with nine planets, namely, ruby with Sun, diamond with Venus, pearl with Moon, coral with Mars, hessonite with Rahu, blue sapphire with Saturn, cat’s eye with Ketu, yellow sapphire with Jupiter and emerald with Mercury. It is widely believed that these stones : the microcosms of these planets, transmit the planets’ positive energy into the wearer and at the same time appease the notorious ones, Rahu and Ketu, and others, Saturn in particular, in their unfavourable phases, and thus mitigate their adverse influences. Astrological tradition perceives all planets to have recurrently the negative and positive phases, and these stones have a role during both. With ‘cause-and effect’ basis being lost the astrology has reduced to a body of believes, though most widely shared. Now enthused researchers world-over belonging to different disciplines are seeking to co-relate a particular stone’s ingredients, properties and elements with the planet that it represents and scientifically establish the truth of such astrological beliefs. The deep red ruby, a term developed out of the Latin term ‘ruber’, meaning red, is contended to be the Sun’s stone and enjoys accordingly the supreme position among all stones. While other stones form part of an image’s ornamentation, ruby usually used for defining the ‘tilaka’ – the auspicious mark on the forehead, integrates as image’s body-part. Capable of developing ability to command, rule and lead ruby was kings’, and is now leaders’, favourite stone. Ruby also develops will-power, vigour, self-image and public perception, purity, virtue and independence. Diamond, the most expensive, hardest and largely colourless mineral known for its rare brilliance that it acquires by high dispersion of light, is the most sought for stone by both, jewelers and astrologers. Linked to Venus, the goddess of beauty, art, music, literature and creativity, diamond effects harmony in all walks of life. It brings luxuries, prosperity, success, abundant happiness, name, fame, wealth and artistic talent. Not a rare stone but a rare find obtained from oceanic depths a pearl is a hard, lustrous spherical mass, whitish or bluish-grey but in any case endowed with a touch of softness. A pearl is another most favoured jewel of kings and elite. Composed of calcium carbonate within the shell of an oyster or other bivalve mollusk a pearl is unique in restoring peace of mind and getting rid of turbulences of the mind and life. Like pearl coral is also a product of the sea. It is the fossil of a sea-creature known as coral and heat and light play decisive role in its formation. Its colour varies from orange to brick-red. In astrology coral is venerated as the physician of mankind as it protects against epidemics, strengthens blood and reproductive system and improves energies. By the change of its colour a coral piece not only indicates the imminence of an illness but also cautions against the presence of poison around its wearer/bearer. Coral quietens emotions, gives courage and improves work-capacity. Hessonite and cat’s eye, known in Indian astrological tradition as Gomaid and Lahasunia respectively, are considered as semi-precious stones, though with their ability to mitigate the adverse influences of the fiercest planets, Rahu and Ketu, these stones are highly venerated for their exceptional astrological influences and mystic power. Hessonite is a highly glossy stone even in its natural form. It is found in two hues, orange-red and deep colour of honey, as one used in this pendent and is considered more effective. It protects against the ill-effects of Rahu and develops a sense of clarity and brings popularity. Cat’s eye is stone that has within its body fibrous inclusion or cavities, or narrow bands of colours, usually white, sky-blue, green and black. It is a stone that is only polished but not faceted. It is unique in relieving from uncertainties, and gives concentration and confidence and develops ability of decision-taking. Yellow sapphire, blue-sapphire and emerald are stones of the same family. Yellow sapphire is an expensive and rare stone. It is found in three colours, yellow, orange and gold, of which yellow is the purest and most effective. Representing Jupiter, the planet of wisdom, yellow sapphire develops knowledge of law, as also religious leanings, ethical character, wit, wisdom and also happiness and good health. The beautiful deep blue transparent blue sapphire has power to prevent diseases such as paralysis, teeth-problems, asthma and bones’ related ailments. The deep green emerald helps mental alertness, prevent memory deterioration, and develops communication skill and mental control.